Strawberries, yogurt, and almond milk gets a citrus kick from orange juice and a bit of protein and thickness from blanched almonds. It works as a breakfast smoothie, but also as a healthful snack or even a refreshing dessert in hot weather. Using frozen strawberries makes a thicker, more milkshake-like smoothie. If you'd like that effect but don't have fresh strawberries, see how to freeze strawberries (they'll be ready to thicken this smoothie after just 30 minutes in the freezer). If you use strawberries you bought frozen, make sure they are IQF (individually quick frozen; that is, not frozen in a syrup) and unsweetened. If using fresh strawberries, be sure to gently rinse them clean and pat them dry. Then hull the berries: insert the tip of a paring knife at a 45-degree angle from the side of the green cap; twist the strawberry around the tip of the knife to cut out the green stem end and the white calyx underneath. True hulling like this gets out that usually-not-great calyx without sacrificing delicious red fruit along the side of the top the way that simply lopping off the tops of strawberries does. See our advice on how to hull strawberries if you're still unsure of how to do this; once you learn how to hull strawberries properly and see how much more berry you end up with, you'll never go back to just cutting off the tops again. Put the strawberries, almond milk, yogurt, orange juice, and almonds in a blender. Whirl until smooth and frothy. This will involve letting the blender run a bit longer than you may think, especially if you're using frozen strawberries: you really want everything lovely and smooth, and breaking down frozen berries will take longer than simply pureeing fresh items would. Use 1 1/2 cups water and 1/2 cup almonds in place of the almond milk for a more substantial and more almond-centric smoothie. Replace some or all of the strawberries with another smoothie-friendly fruit: blueberries, raspberries, peaches, or cherries (pitted, of course). Add a few leaves of mint to brighten everything up even more. Throw in a pitted date for a sweeter and more deeply flavored smoothie. Go dairy-free by using a banana or two instead of the yogurt. Smoothies don't keep well and thus making them ahead on purpose is not recommended, since they tend to settle and separate out. 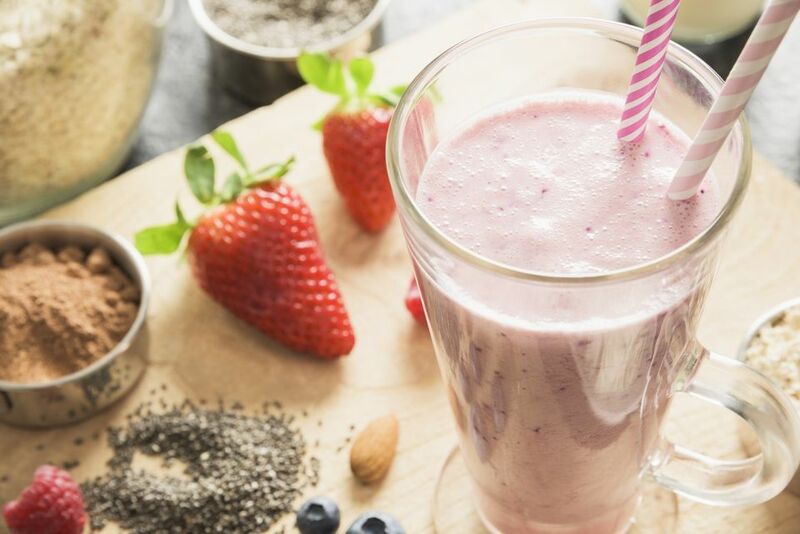 If you still want to make it ahead or if you simply have excess smoothie you want to save and enjoy later, you can cover and chill the mixture and then give it a quick trip back into the blender or at least plan on whisking the mixture back together before serving it. If you do this, you will see why one can't recommend this as a true make-ahead: in the time it takes to do any of that, you might as well as just made the smoothie.